Do you remember this series of books? 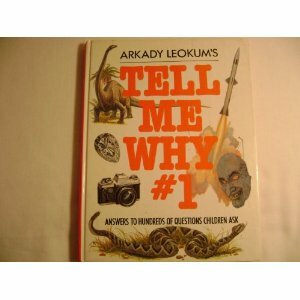 The "Tell Me Why" books were meant to offer up answers to kids' inevitable and constant questions about the world in those pre-Internet days. This Metafilter question says that there was a 1960s series and then they were revised in the 1990s. The poster doesn't care for the modern version, as with so many revisions, they kinda took the charm out of them. If you didn't have these books, what works did you turn to as a kid for reference? Did your folks have a full set of encyclopedias, or other general reference books, or did you practically live at the library? We had the encyclopedia set. They had purple covers and were from 1968. By the time I was doing reports in 1981, they were pretty useless. My mom's favorite response to a question was, "Well, look it up!" I had one of the "Tell Me Why" books, plus at least one trivia book. And we always had the "Information, Please" almanac and the "Guinness Book of World Records". Everything else required a trip to the library. We had Columbia encyclopedias from the 70's and funk & Wagnell's encyclopedia from the early 80's. Both sets bought book by book at the grocery store. My parents bought me a whole slug of Tell Me Whys. I loved them as my non-fiction reading material of choice. My favorite 'answer' was on how chocolate was made and illustrated with a little green picture of a whole pile of delicious looking chocolate...including a little chocolate turkey, which I always wanted to have. I even managed to fake my way through a junior high marine science reasearch paper by citing them. Sad was the day my mother, a substitute teacher, took some of them in to show one of her classes. Some thief absconded with several volumes, rendering my collection incomplete.